This post has been sponsored by Plaid Crafts. I was provided materials and/or compensation, but all opinions are 100% mine. 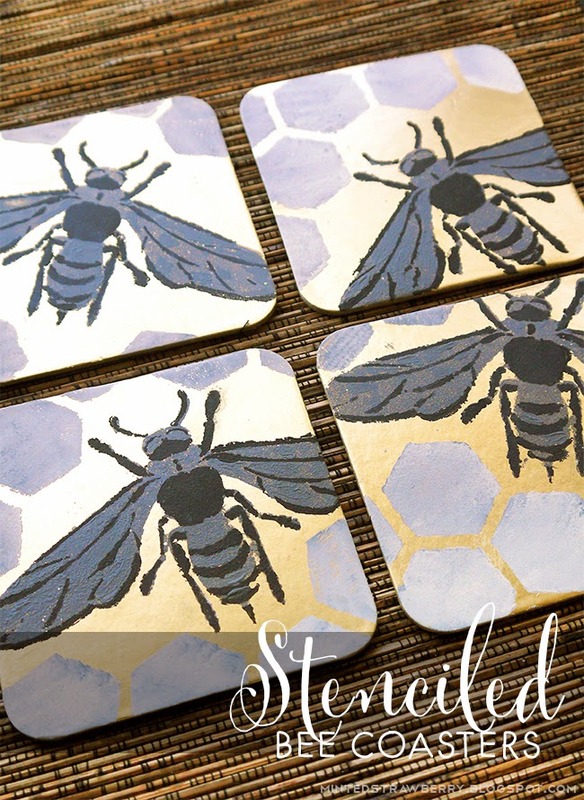 Today I'll be showing you how I made these bee coasters using Ed Roth Stencil1 stencils from Plaid Crafts (they're available at Jo-Ann Fabric & Craft stores). I am not lying to you - when I got these stencils from the mail, I squealed. I am obsessed with a lot of patterns - the beehive pattern being one of them (remember this photo wall art?) and I was just lucky enough to get them! My mind swum with what I could do with it - these stencils are large enough to cover large spaces such as walls or pretty big canvases, but I know I don't have the patience to do something like that yet. So I made a couple of things - a set of coasters was one of them. 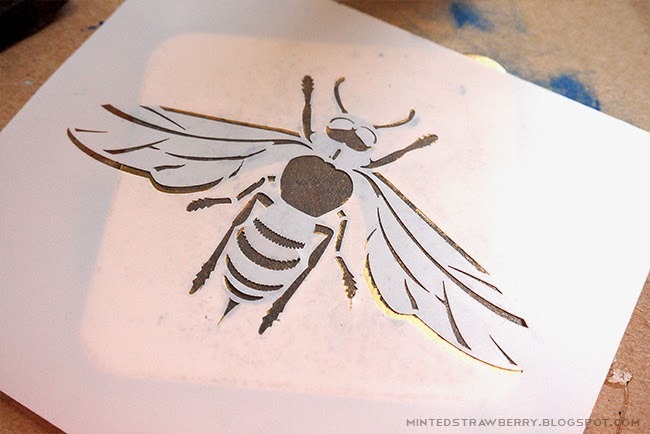 I wanted to try the bee stencil too - it came with a base stencil and a detail stencil and I just found that so cool (because I'm not really one for free-handing details). 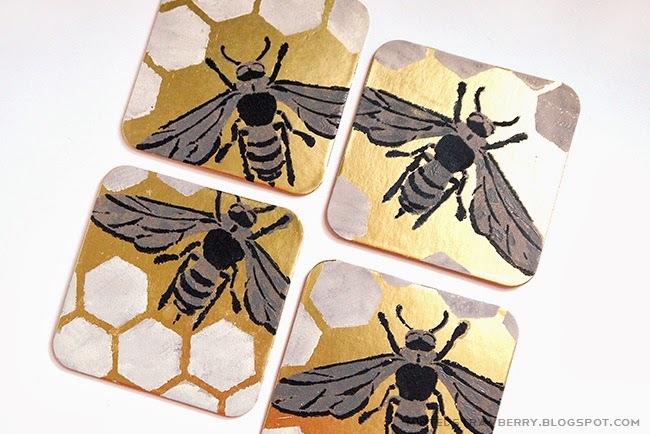 First, spray paint your coasters. I used gold as my base, because I love gold (no surprise there :3). 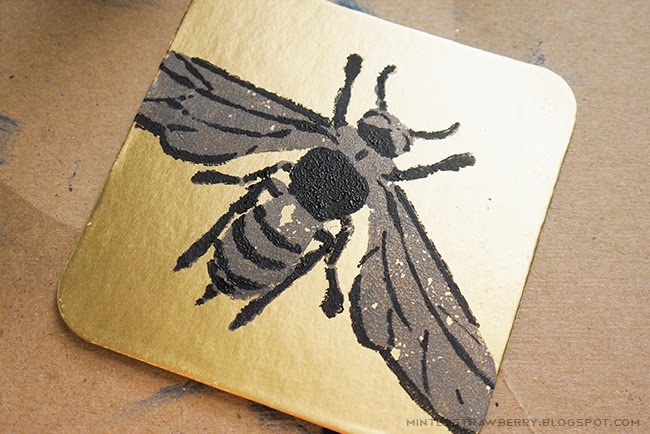 Next, take your bee base stencil, position it on your coaster and fill it in with paint. These FolkArt multi-surface paints can be used for indoor/outdoor purposes and on a variety of materials - honestly I love FolkArt paints, they're what I use for most of my projects. 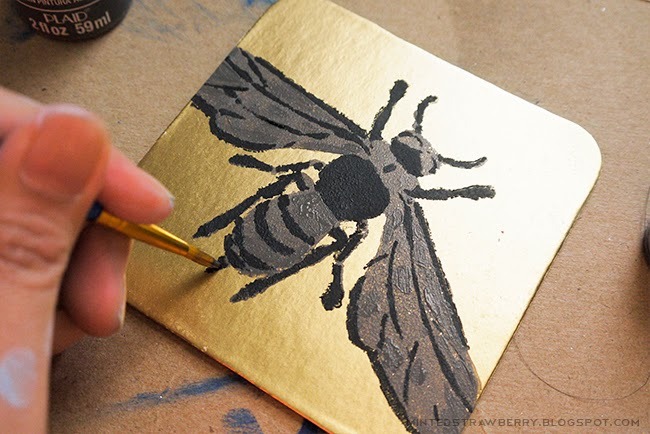 Next, take your detail stencil and position that on top of your stenciled bee base and stipple with a dry brush loaded with just enough contrasting paint. 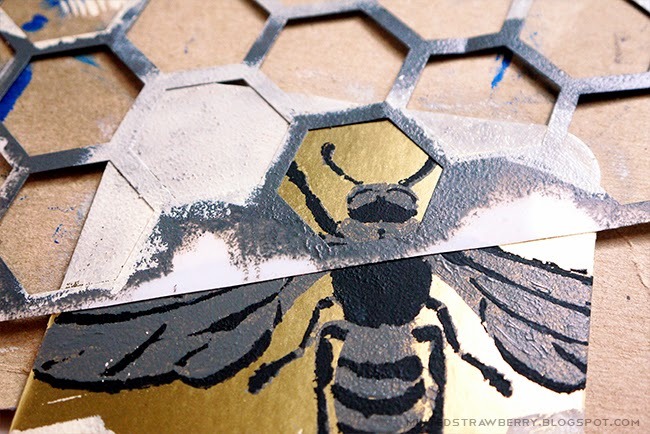 Tip: spray the back of your stencil with some repositionable adhesive (don't spray too much though or you'll end up with something like the photo below when you pull it off). Since I was too trigger-happy in adding repositionable adhesive, I got some bald marks when I pulled my stencil off. But no worries, there's a solution for that! If you ever end up with bald marks, fill them in using your base paint and a small brush. For added detail, I used the honeycomb stencil to add some hexagons on the coaster- filled it in with a light color without washing my sponge brush (hence the grungy, grey-ish white effect that you see). 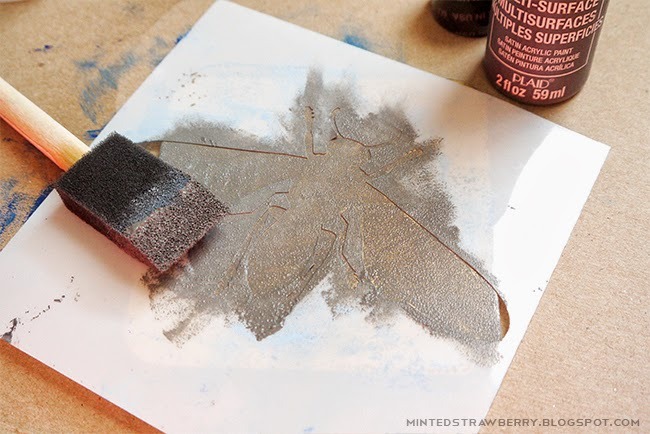 Don't worry about that messy stencil - it's easy to clean. For a glossy effect, you may want to spray it with some clear glaze. 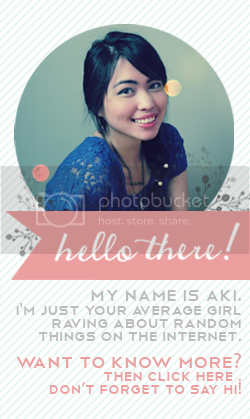 Hope you enjoyed this project, and don't forget to pin/share if you did! 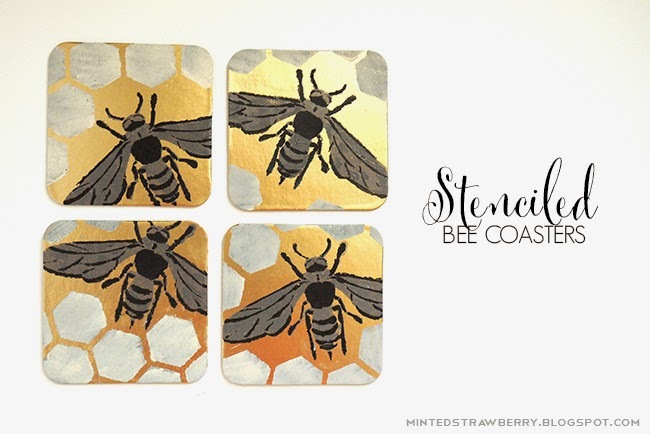 And also, check out these other projects using Stencil1 stencils - see all the awesome designs that they have! 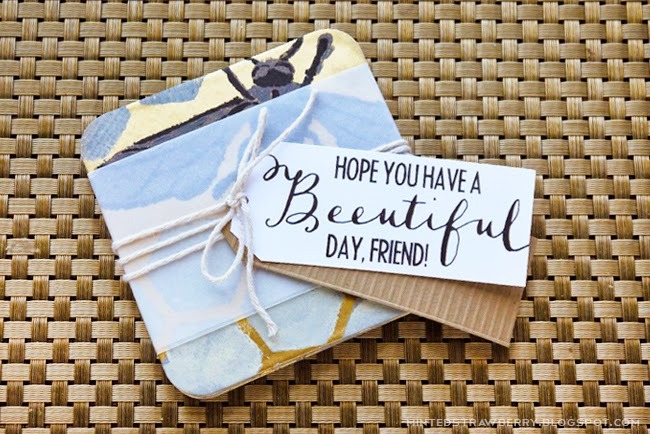 Don't forget to follow Plaid Crafts for more awesome project ideas, inspiration and more!